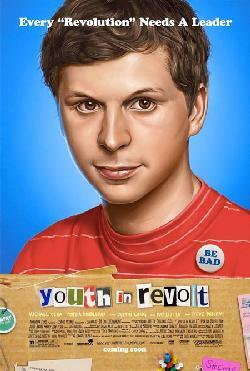 *Despite turning 21, Michael Cera apparently has no problem remaining typecast as a terminally-nerdy teenager. Since appearing as an awkward geek in Superbad in 2007, we’ve seen the baby-faced thespian play slight variations of the same archetype in Juno, Nick & Norah’s Infinite Playlist, Paper Heart, Year One and, now, Youth in Revolt. This time out, he’s Nick Twisp, a 16 year-old with raging hormones who’s obsessed with losing his virginity. How original! And the object of his injection is his proverbial girl next-door, Sheeni Saunders (Portia Doubleday), the prettiest girl living in their seedy trailer park. Worse than that stale premise, is the script’s stilted dialogue, which must have been lifted verbatim from the picture’s source material, the six-part serial novel of the same name by C.D. Payne. How else can you explain Sheeni’s sounding so unnatural when asking Nick to put some suntan lotion on her back: “Would you mind applying this to my exposed areas?” How weird is that? Worst of all is the profusion of colorful supporting characters providing practically non-stop comic relief via an array of increasingly bizarre behaviors. Each one is a simplistically-drawn stereotype. Consider Sheeni’s uptight, Bible-thumping parents (M. Emmet Walsh and Mary Kay Place) and her rebellious big brother (Justin Long) whose idea of a practical joke is to lace Thanksgiving dinner with hallucinogenic mushrooms which cause their father to smear mashed potatoes on his own face. Then there’s Nick’s sexaholic mother Estelle (Jean Smart) who gets over the death of her live-in, loser boyfriend (Zach Galifianakis) by seducing the police officer (Ray Liotta) sent to inform her that he’s just dropped dead of a heart attack in the supermarket. Additional madcap antics arrive courtesy of a menagerie rounded out by Nick’s cradle-robbing father (Steve Buscemi), his 20 year-old girlfriend (Ari Graynor) and a goofy neighbor (Fred Willard) thrown in for good measure. In order to summon up the courage to seduce Sheeni, Nick relies on encouragement from Francois Dillinger (also Cera), a suave alter ego sporting sunglasses and a pencil-thin moustache. But Francois’ ideas only set off a chain reaction leading legal trouble and leaving Nick facing the prospect of losing his virginity in jail. This and every other skit in this ill-conceived sketch flick falls flat. As for Michael Cera’s career? Look a falling star! Make a wish! Rated R for sexuality, profanity and drug use. Next ArticleWhy Can't They Get Along? Dissension Divides Black Critics.